A new group of tagged manatees will help scientists better understand how these gentle giants use coastal Georgia waters, especially near Kings Bay submarine base. In the project led by Sea to Shore Alliance, the Georgia Department of Natural Resources, and Georgia Aquarium, eight manatees were recently caught, fitted with GPS transmitters, and returned to Cumberland Sound. 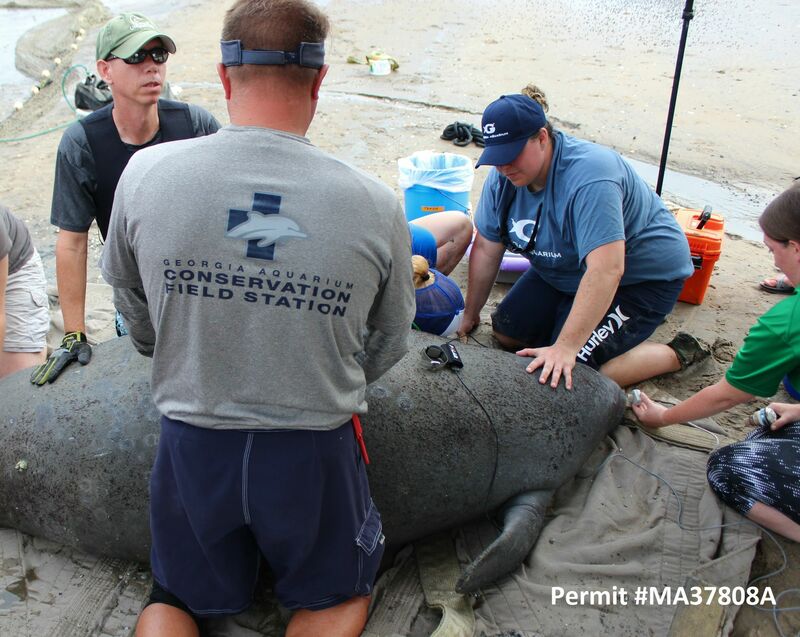 Two of the 13 manatees tracked the past two summers are also still transmitting. The goal is to map this protected species’ movements near Naval Submarine Base Kings Bay, document migratory paths and habitat use in the region, and collect baseline data to help assess manatee health. Biologists are confirming things they long suspected: the importance of the Intracoastal Waterway, or ICW – a narrow passage of natural and dredged rivers between the mainland and barrier islands – for manatees moving along the Georgia coast. The GPS data also shows that manatees regularly venture into the submarine base, they’re able to find artificial freshwater sources to drink from, and a few have traveled into the open Atlantic. Understanding habitat use and migration details can benefit manatee conservation efforts, according to Monica Ross of Sea to Shore Alliance. Manatees migrate from Florida to Georgia in spring. They occur in tidal waters throughout coastal Georgia from at least April through October. Yet shorter winters and warming waters have widened that window. Manatees were reported at Kings Bay this February. Weighing more than a half-ton, these slow-moving animals swim just below the surface, often putting them in harm’s way of boats. Since 2000, boat collisions have caused 27 percent of manatee mortalities documented in Georgia. Staff from wildlife agencies and organizations in Georgia and Florida handled the eight manatees in Cumberland Sound May 31 through June 2. With a DNR helicopter spotting the animals, a custom manatee capture boat from Clearwater Marine Aquarium was used to encircle them with a net. They were then pulled onto the boat or a bank to tag and examine. Biologists and veterinary staff, led by veterinarians from Georgia Aquarium and the University of Florida, examined the six male and two female manatees, took samples, fitted each animal with a transmitter and released all unharmed. Ross monitors the manatees daily online, and along with DNR staff, regularly checks them on the water. “At least every two weeks, we’ll physically locate each animal, to see what they are doing, check the equipment and take the opportunity to photo ID other animals they might be with,” Ross said. “If at any point the tag activity is abnormal, we will get eyes on the animals immediately. Each transmitter, tethered to a belt that fits around the small area of the body near the tail, floats at the surface behind the manatee. The device does not impede movement or pose a risk of entanglement and is designed to part easily. Aquarium staff from the animal health and conservation departments, including Georgia Aquarium’s Conservation Field Station in Florida, took part in the handlings and assessments. As of June 8, seven of the manatees were still within 10 miles near Cumberland Island and Florida’s Amelia Island. One had ventured north to the Brunswick area. Project funding has been provided by the U.S. Navy, the U.S. Fish and Wildlife Service, Georgia Aquarium, Georgia Nongame Wildlife Conservation Fund, The Environmental Resources Network, or TERN (friends group of DNR’s Nongame Conservation Section) and Sea to Shore Alliance. Additional staffing was provided by the National Park Service, Clearwater Marine Aquarium, U.S. Geological Survey, U.S. Coast Guard, National Marine Mammal Foundation, Science Applications International Corp., National Oceanic and Atmospheric Administration, U.S. Fish and Wildlife Service and Florida Fish and Wildlife Conservation Commission. Report the manatee to Georgia DNR by calling 1-800-2-SAVE-ME (800-272-8363). Note the time, date, location, color of the tag and whether any other manatees are present. Do not chase, touch or otherwise harass the manatee, or touch the tag. The tag is harmless to the animal.